When it comes to design, I’m a stickler for quality over quantity, but with the invasion of cheap Asian-manufactured furniture, it’s tough to find great quality furniture that does not require taking out a second mortgage. When it comes to sofas though, Canadian manufacturer Perez is well worth a look. Prior to opening up my retail store Fluid Living back in 2000, I met the founder, Daniel Perez and was so impressed with his new furniture designs that I immediately added the line as a complement to my own furniture collection. Fast-forward almost ten years and with umpteen additions to the line, I still think they are the best in the business. The philosophy of Perez has always been based on a combination of great contemporary design, high-quality craftsmanship, and affordable pricing when compared to higher end European names. Pieces are hand-built by craftsmen using only hardwood maple frames. Instead of using traditional coil springs, Perez has taken a cue from the top Italian manufacturers and uses rubber webbing as seat support, which lasts much longer and ensures that creaking will never be an issue. My favourites in the line are the Sam sectional and the Oslo chair, which is a great reinterpretation of classic Scandinavian modernism, manufactured in walnut instead of traditional teak. 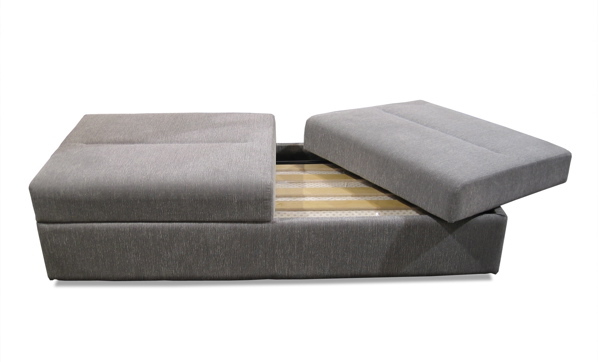 The Konran ottoman (pictured) is also a great design for those with small home offices requiring a guest bed without taking up a load of space. Perez recently opened a new showroom at 35 Bathurst Street, near King and Bathurst in Toronto, which showcases a collection of sofas, sectionals, pull-out beds and beds. If you’re in the market for a new sofa or sectional, you should really go check them out. Perez, 35 Bathurst St., 416-603-4446.